With the increasing number of responsibilities, challenges, and issues that today's Boards face, many continue to search for a way to increase the quality and speed of their decision-making. The ability to filter and prioritize an increasing amount of decisions and initiatives that make their way to the Board reactively, alongside existing proactive Board responsibilities, also has a profound effect on the morale and camaraderie of the Board Members. As expectations of Boards increase in parallel to business complexity, Boards have increasingly found themselves at the apex of loading and time management considerations that have a direct correlation to their effectiveness and success. Implementing a sound decisioning process can be a welcomed solution to assist with these obstacles. Now, some may ask, "Well, aren't these typically concerns that would increase pressures for the CEO and not necessarily the Board?" This may seem the likely case in theory, but it has not been the reality in practice. In public company Boards, the heightened focus on regulations for compliance and risk is many times the culprit. More commonly, as the components of goal setting and strategy creation/honing have embedded deeper at the Board level, which I am a huge proponent of, CEOs (or the equivalent Executive Directors for nonprofits) along with their Boards are in many cases simultaneously engaged in these activities. A significant number of my advisory consulting engagements and Board Meeting facilitations in the early part of this year contain a requested component of decision-making best-practices for Boards to follow. This is concrete evidence that Boards are searching for a silver bullet to solution their challenges in this space without undermining their authority or overstepping their bounds. A successful approach to put structure and meaning into a Board's decisioning process can be seen further in this article. 2) The Board should ask themselves, “Does the proposed initiative align with our organization's Vision?” An organization's Vision outlines what a company wants to be, or enable, in the future. Boards should operate as a true guiding force in keeping their CEO, and organization, on course to live up to their future plan and potential. This can be done by comparing a Board's proposed decisions, initiatives, and actions to the organization's future state - the Vision. If they are not in support of the organization's future-state, they will only act as a distraction, or worse yet, a derailer to where you want to go. 3) The Board should ask themselves, “Does the proposed initiative align with our organization's Mission?” An organization's Mission outlines what a company currently does, or wants to do, well. How much time do organizations waste yearly on efforts that do nothing to support the current business model? A lot! This is no different at the Board level. Move these distractions off the decision docket asap and focus on things that matter to the current-state business. 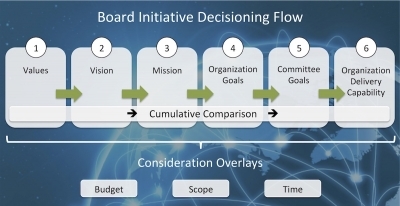 4) The Board should ask themselves, “Does the proposed initiative align with our organization's overall Goals?” Many Boards miss the important correlation between decision-making and goals. This mismatch is a common underlying derailer for Boards and their organizations to achieve success. Why? Because goals are what you are comparing your progress against. Goals are what a Board is actually governing! An effective decisioning process must operate under the assumption that the Board and CEO (or Executive Director) have an integrated approach to goal setting and a method to measure the progress of achieving them. 5) Each Board Committee, and the Board, should ask themselves, “Does the proposed initiative align with a specific Board Committee’s sub-Goals as well as the overall Board’s goals?” Board Committees have a unique role in the effectiveness of the overall Board. After all, this is where the 'work' gets done within a Board of Directors. If your Committees are weak, the entire Board is weak. When correlating decision-making to Board Committees, some decisions require data and further information to come to a valid conclusion. It should always be quite obvious which Board Committee will handle what work, assuming the Board architecture is correct. Ensuring that any and all initiatives that a Board Committee is working on align with a) the overall organization's goals, and b) the Committee's sub-goals, in support of the overall goals, is key. 6) The Board should ask themselves, “Does the organization have the expertise and resources to effectively and efficiently meet this goal?” This is an interesting one to ponder. There are many savvy Boards that can assist in, as well as approve, strategy and governance models... however, does the Board have an in-depth understanding of the organization's delivery capability and are they able to spot risks before they become issues? For an effective Board, the answer must be yes. Throughout the 6-step decisioning process, the overlay considerations for budget, scope, and time need to be continuously considered for valid outcomes. It is very likely that Board loading and the volume of decisioning will increase in upcoming years. Boards that are not prepared for this with a repeatable thought process and reference tool could find themselves at the mercy of overload and paralysis - as well as their shareholders. How will you increase the success of your Board's decisioning process? Reach out directly to Mark A. Pfister to help form and implement your Board's successful decisioning process with his 'Board of Directors Meeting Facilitation & Continuing Education' offering.